I’d like to introduce you to Valerie Goodwin. I have followed her work for several years now as it truly speaks to me. It is organized, beautiful, and deep. And very architectural. I love, love, love it. This might be why. I studied architecture in college but chose not to pursue my graduate degree – Valerie is an architect and a professor at Florida A & M University. Yup – I’ve always wanted to be a professor too. That one might still happen someday. I get such joy watching her succeed and the fact that she has introduced textile art into her own life and ALSO into the life of her architecture students is, well, just SO COOL! And now she has a book. It’s my favorite book of the year. Personal taste here – there are a ton of wonderful books out this year but I love this one. Mostly because of the eye candy. I loved reading the very first pages about her quilt history. She learned from her grandmother but left the needle arts behind when she entered the male dominated world of architecture. I am so, so, so happy that she found a way to join these two parts of her life. 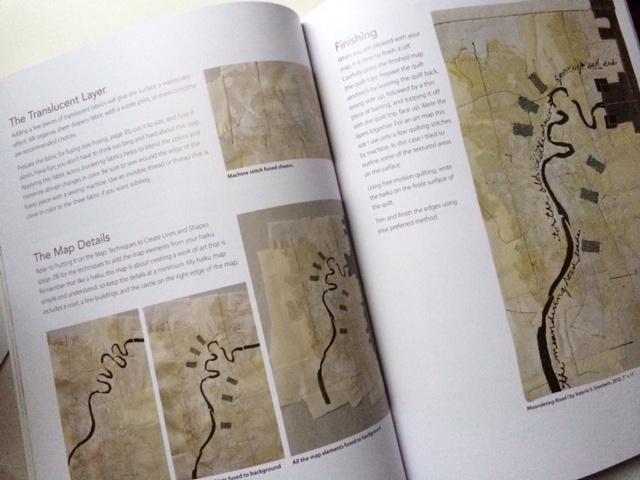 The book itself takes the reader through both the mental design process and the techniques and materials you would need to create your own textile maps. If you love project books you can follow Valerie’s methods and instructions in a linear process and be very happy with your results. She gives the reader plenty of information and a clear road map from start to finish. I tend to be more interested in understanding the thought process behind a good artist’s working method so that I can understand what it is about the work that speaks to my heart. This book is just deep enough to satisfy that craving for me. The illustrations feature the clean lines, the layers of subtle texture, and the visual storytelling that I appreciate in Valerie’s artwork. The writing and instructions give me a peek into her process and there were several things that sparked ideas for what I might like to incorporate into my own work. I think Art Quilt Maps provides a great balance between “how to” and “why.” I love seeing the work of her students and how they have taken her techniques and internalized them, creating unique works of art. Wouldn’t you just love to see this book show up in your stocking? I’m going to give away a copy to one very lucky reader. Has your artwork ever been inspired by a place? I’ll choose one lucky reader on Friday. Tell your friends and have them come check it out too. And if you don’t want to wait until then – you can buy it here. I first encountered Valerie’s work at a Florida Craftsman’s show in DeLand and sat on a bench for quite a while to ‘drink it in’. I continue to be mesmerized by what she does. As to your question, Lyric, at first I could only think of one piece. It was inspired by growing up on the Gulf Coast of Florida. However I did one that came about from the crushed soda cans that end up in the lane out to our mailbox and have done sunprint from ferns in the ferneries next door. Valerie’s quilts are fascinating. I would love to have a copy of her book. I am always being influenced in my art by were I live, the southeastern coastal plain of North Carolina. I love to go down by the salt marshes to sketch & take photos to use in my journals. The very old local cemeteries are also a source of inspiration. I’d love a copy of Valerie’s book, thank you for the excellent review. The book has been on my wish list for a while. As a landscape architect I can relate it the imaging. Mrs G. Continues to be a an uplifting example of conscious practice and teaching. Thank you for sharing your gifts with us. I cherish the piece that you gave me when I graduates college. Like you it is one of a kind. Thank you! I have eyed this book for awhile . . . it is on my Christmas list for myself . . .give a-ways, lol!!! Hundreds sign up and of course its only ONE winner!!! Good luck on book sales!!! Happy Holidays!!! I love the linear nature of buildings, maps and quilts… to bring them all together in one place – what a feast for the senses! Great book giveaway. I love Valerie’s work. Her book is on m wish list. I’d love a chance to win a copy of it. A lot of my quilts are inspired by the mountains and lakes where I live in NH. I’ve always been a map person, so I love this idea of combining my love of maps with my love of quilts. But I can’t help wondering if my map-illiterate quilter friends are going to have to make GPS quilts. Valerie’s book is on my wish list!! Much of my work is inspired by nature, either place or animals. I often work from photographs and strive to create realistic imitations in my fiber art. But, I have recently begun to explore more abstract interpretations, and I would love to have Valerie’s book to inspire me. Wow! Valerie’s work is fascinating! What a cool concept! That would be a nice treat to win her book! Valerie’s book looks terrific, and I love to have an opportunity to read it for new ways to use my constant source of inspiration – Alaska, my lifelong home. Valerie’s book looks fabulous – I’d love to read it for more ways to translate my constant inspiration – Alaska, my lifelong home. My work is generally inspired by beautiful places I have visited, and it’s most recently inspired by a trip to the Butchart Gardens in Victoria, BC several years ago. I’ll never forget the overwhelming beauty, color and sense of wonder I experienced in those gardens. Thanks for the opportunity to win the book. Yes places inspire art! The most recent inspiration that became art is the Narrows at Zion Nation Park–little tiny people and REALLY tall walls. I thought of Zion when you posted your summer trip. Before that a trip to Paris and specifically Sainte Chappelle inspired my first quilt/first art quilt/an as yet unfinished series of Bible story quilts. The completed quilt is about 50 x 50 with sketches for 5 more quilts. I started as a glass artist before I came to fabric and there is a view of the Point Wilson lighthouse in at Fort Worden State Park in Port Townsend, WA that became a glass panel for my parents–one of my favorite memories of vacations with my brother. I have been interested in this book ever since I first heard about it. My work is inspired by where I live, and it would be fun to look at her book and apply it to Wyoming. I am currently working on a project inspired by a place. I visited the old French Lick Hotel in French Lick, Indiana. The floor is made of really small mosaic tiles from Italy. I am working on a hexagon quilt based on a drawing I made of the floor. I really think I’m going to like it (if I EVER get it finished). This book looks fabulous. I’d LOVE to win it. Lyric, thank you for the link to your Quilt Show episode. You are a wonderful teacher and artist! I have been inspired by the birds in different places I’ve traveled, and am working on a couple of abstract pieces about those birds. Thanks for doing this! I’m putting your book on my wish list too. My artwork is usually inspired by a place. My pieces almost always come from a photograph I’ve taken and many of them photos from living in Italy. The book looks intriguing. Thanks for the giveaway! This book is on my Christmas list. I’d love to be inspired to turn my urban photographs into a quilt of my own design. As an historian turned quilter, architecture and the history of places has always intrigued me. My travels have often inspired my art. I think this book would also be quite inspiring. I’ve seen the cover of this book, thanks for the peek inside! I love Valerie’s work! I love old buildings and made a small quilt inspired by a gorgeous old building in Soho when our online group Tangled Textiles had an architecture themed challenge! Very interesting. Love the idea of bringing text and image together with mapping and a sense if place. would love the book to introduce ideas to my classes. Really love the idea of mapping and sense of place. Images look beautiful. It seems like this book brings text and image together in an interesting way. very anxious to read it and incorporate ideas into my classes. For the past number of years my work has been inspired by the vivacity of the urban landscape. My current series, Vanishing Pont, focuses on cities lived and remembered but more specifically the fading memories of those places. Perhaps it is the last look of a loved place through the rear view window of the moving truck or that fading memory of a summer evening at a sidewalk café. 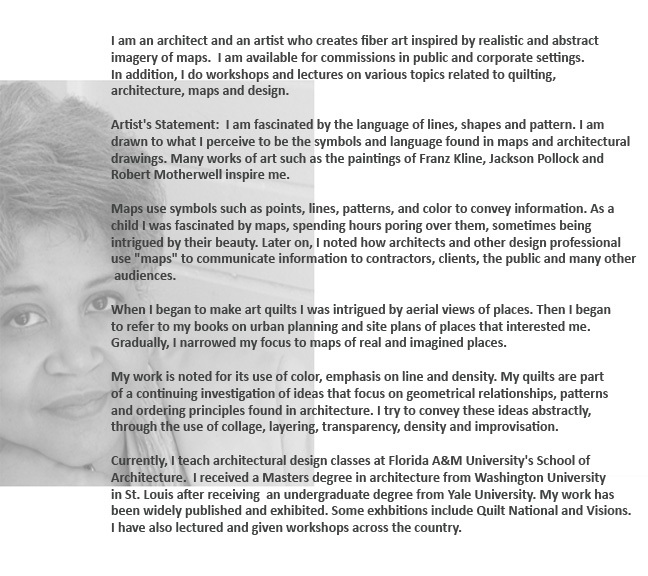 I have admired Valerie’s work ever since I saw an image of one of her map quilts a few years ago. Her book immediatley went on my Christmas want list. Thanks for this opportunity to get into the drawing on Friday and also to share a bit about my own work. I”m making a quilt of our trip through Italy this sommer. We were travelling around for 6 weeks and have seen a lot of landscapes and old cities. I should love to win this book, it learn me a lot. Our guild was lucky enough to have Valarie as a speaker and she is so inspiring. 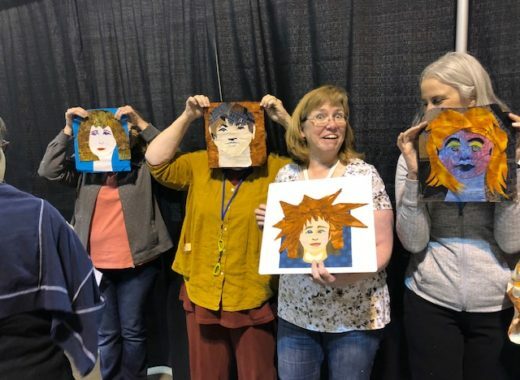 I especially like that she is inspiring others by creating a class assignment for her students that involves quilting. I am often inspired to integrate my underwater diving experiences into my art quilts. I have used my photography for a couple of quilts and am always looking for ways to expand my horizons. The book looks extremely interesting. Valerie’s book looks very inspiring. You are right about it being eye candy. I don’t own the book but I think it needs to be on my wish list. 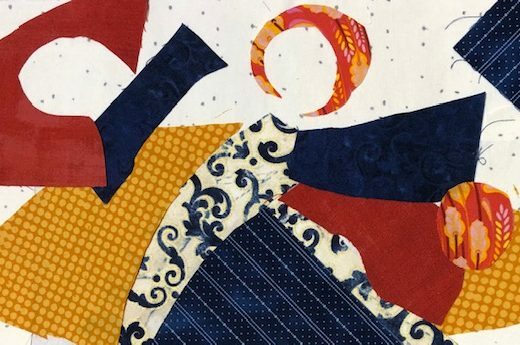 What Valerie does is unique in the art quilting world, and it gives all of us another way to think about the role of “place” in our own work. I’ve made a number of pieces based on the sea, and also on looking down from above, like the view from an airplane window, but have never abstracted a real or imaginary map. That’s probably going to be a project that will begin soon, but I’m sure it will be quite different from Valerie’s method of representing a place. Nevertheless, I’d love to study and learn from her book. I have always loved maps. When I travel I collect the maps in the guide books. My artwork is often inspired by a place I have been, the colors , the feel of the place to be able to reconnect with the feelings I had while there. I would love to win this book! Valerie’s work is so inspiring! I use some of my photography in my art quilts, and one I especially like was taken of the galley of a tall ship while traveling in Nova Scotia. I’ve also taken a lot of shots of building in downtown Toronto, and I’m hoping to use some of those in art quilts too. Thanks for the chance to win Lyric! Thanks for the post on Valerie and for me, an introduction to her. Her book looks awesome and something I’d love to have. I made a wallhanging based on a picture. It’s of my Mom and sister on the drum at a local pow wow. I also added each of our animals that our Native names are based on for our whole family and the animals are scattered around. It was alot of fun and would love to do another one. Although so many of my quilts are based on inspiration gleaned from nature, I also am drawn to lines and geometry in architecture – have nearly as many reference photos of buildings, walls and steps as trees, leaves and mountains. This looks like an excellent book to help me explore more that secondary interest of mine. And yes, many of my quilts do capture a particular place/scene. I see this book as helping me to expand upon that. So many of my quilt inspirations are based on places I’ve lived or travel through on vacations. Using the structure of a map adds a new dimension to the images in my minds. Thanks for making the possibility of this book available here! I’ve not made lot of place-inspired quilts, but I have made one about a place I love. I’ve studied for 5 years in another city, Ancona, and one of the most beautiful places of the city is the duomo, built on top of a hill, in front of the sea. I used to go there to watch the sunset. Wonderful. near the church door there are two marble lions. I’ve made a quilt about one of those lions. I was so inspired by Valerie’s talk at the Folsom CA Guild. Her work is wonderful – such creativity. This book is on my Amazon list. I can’t remember where I first ran across her – perhaps a magazine? – but I find her work so inspiring. Each time I fly, I envision making a quilt from what I see from the air. I can’t say I’ve ever made a quilt based upon landscape but I am working on an idea for a quilt based upon some art work in a museum that we visited in Vienna earlier this year. And, I’ve done a Klimt inspired piece. I heard Valerie being interviewed by Pat Sloan recently and had to go look up her work because it sounded so interesting – I think she is my new favourite artist! I live in New Zealand and many of my quilts are inspired by the view out my back door. I see the sunset from there and the dawn mist. Often outlined against it are flax flower spikes and a Tui (a native bird) feeding from the flowers. So beautiful. I live in Canada and have been from one coast to the other. Yes, my work has been inspired by all the lovely places I have been to. This book, from just your little snippets, look like something I would love to have. Thanks for the chance to win. A month long road trip to Houston for the International Quilt Fest to see my sister’s quilt in the Architecture of the Quilt Exhibit, gave us the opportunity to photograph many buildings and sites. Later I entered a quilt in the same exhibit using the Texas photos. Looking forward to reading her book….right up our alley! inspire me to but in a much more colorful way I love the look of plowed and greening fields of forrest and water. I need to think of neutrals and land sky sea. Thanks for the introduction to the work of this wonderful artist. I too am inspired by line, shape, geometry. I have on occasion been inspired by a place. A recent piece is called Crop Circles, an aerial view of white-on-white using silk noil. This book is going on my wish list. This is an inspiring book. I have made quilts inspired by imaginary places. My eldest child loves dragons and we read about them when he was a child. I have created a couple of quilts about their places. The same son is now living in Austria and I hope to create a work from the pictures he sends me and hopefully form my own eyes when I visit. Thanks for the free link to your visit on the quilt show. I am a basic member, my paid subscription has run out and I am unable to renew at this time. I was a bit miffed I’d miss your interview. The giveaway looks like a great book. I like to look at and try new things. 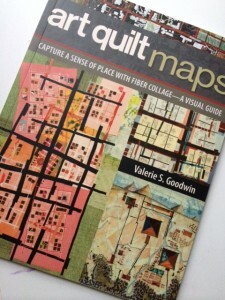 This would be a wonderful book for inspiration in making map quilts. I would love to have this book since I have followed Valerie for some time. Interesting question. At first I thought, no. Then wondered if places I visit have become part of my subconscious ideas framework. Which is probably true, but then I realized I was being too literal. A visit to the Denver Art Museum greatly influenced my quilt thought process. I’d say the Native American exhibit was the most influential. It was full of graphic art that is very different than the way I design. It was like art/brain candy. The way they put a handful of triangles or oriented lines in negative space. I took lots of pictures so I can reference them when I need some design refreshment. I don’t know if your draw includes international. But just mentioning that this is on my Christmas list! I was honored to end my teaching art career by having Valerie have a workshop for art teachers in Leon County. She inspired me to make mini game board quilts.. the one of the recent places that inspired me with my art work is the Baltimore Folk Museum. I loved the funky recycled art works there. I’d love Valerie’s books. Thanks for letting me know about this book — she’s one of my favorite artquilters. I’m also inspired by maps in my work. My most interesting was a two-layer piece with the “natural” layer as the base and a semi-transparent floating layer of the built environment (I had to use a frame to float the layers about .75 inches apart). I’ve been following Valerie’s work for several years. Many of my art quilts were inspired by places in nature. I love Valerie’s use of maps and urban environments. I love the patterns inherent in taking the “40,000 foot view” of anything. Valerie’s work is wonderful! For me, places, all places, certainly do inspire my art. Some places just get stored a little longer in my memory. Structures meld with the memories, and even some distortions, to create a new artwork. Valerie’s book is on my wish list too! Love her work and would love a chance to win her fabulous book. I so enjoyed Valerie’s class she gave to the art teachers of Leon County. The class was given at the end of my long journey of teaching art in the public school system. Her class motivated me to make quilted mini game boards. One o the places that motivated me with my art is visiting the Baltimore Folk Museum. What treats- Valerie’s workshop and the Baltimore’s funky museum. I’ve known of Valerie’s work for some time and have had the bk on my wish list since it came out. I have been trying to use maps in my artwork and am having difficulty pulling it off well. While I am not usually a projects-bk person, I think hers would really help me master the genre since you say she really explains things well. Valerie’s book is also on my wish list. I did a weekend on making maps with Alicia Merrett in the UK and it was great. 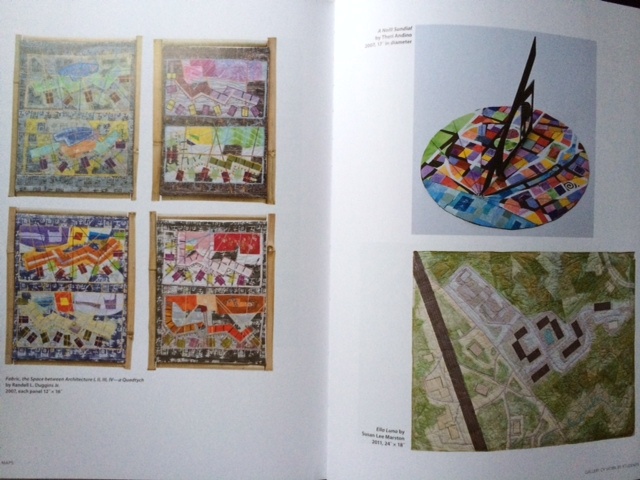 She had recently bought Art Quilt Maps and had it there to show us. Have a look at Alicia’s website to see her style of fabric maps. Quite different but equally beautiful. Love Valerie’s work! Her map quilts are fascinating & I would love to read more. I participated in an “Urban Decay” challenge a few years ago & photographed several examples around town. I took a photo of broken windows with a reflected tree, and made it into a quilt that was part of the “Tactile Architecture” exhibit in Houston this year. What a thrill to have a piece in the show! I love Valerie’s work and did not know she had a book out. 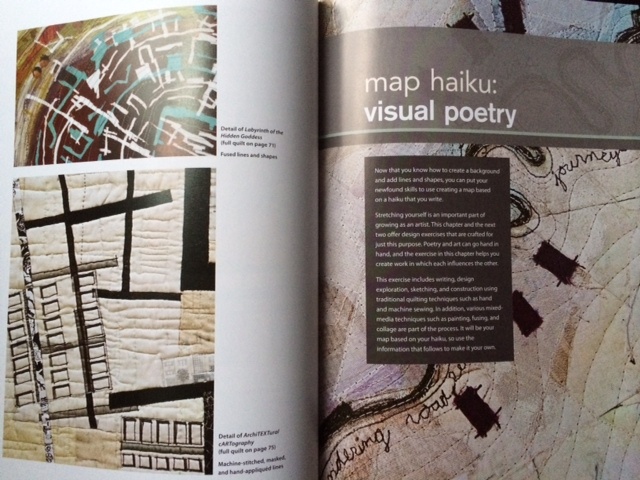 I would love to own this book as I would love to incorporate my love of maps into my art work. I have been following Valerie for several years, as well and I really would like to take one of her classes. I collect vintage maps and want to use them in my work. 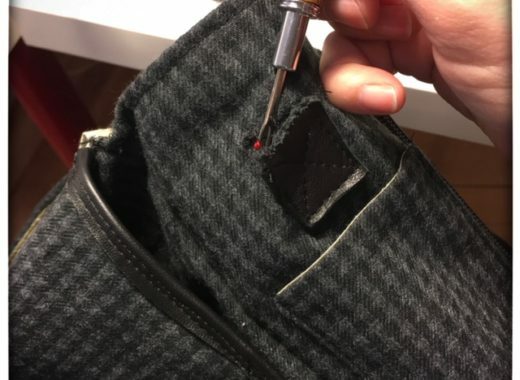 I have never seen this technique before. I was born and raised in Detroit MI. On “street view”, I can see that the house of my childhood has been abandoned and all those “memory spots” in the area are no longer safe enough to revisit. How I would love to recreate my memories but trying to create an Art Quilt Map. 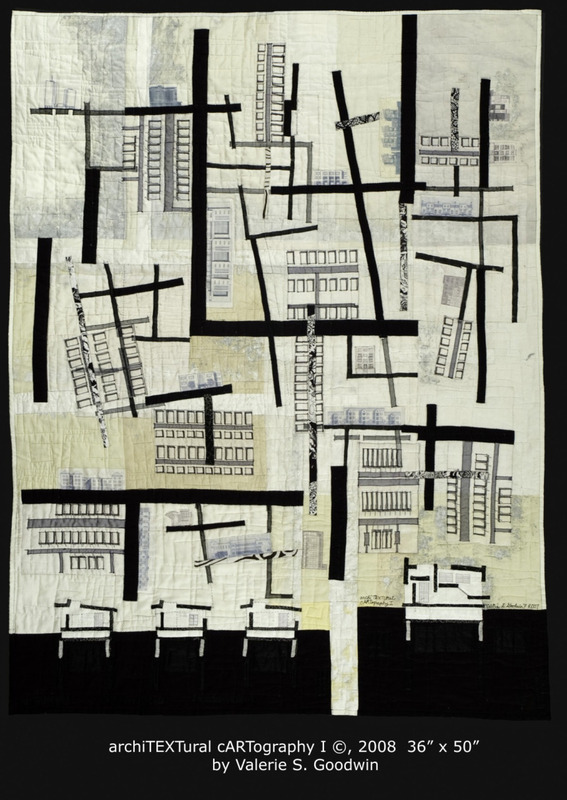 as I am also an architect and doing patchwok I am very interested in architectural quilts. In this category Valerie’s is far more interesting than anything else. I didn’t purchased the book but I intend to. Your work is so great and different that I wish you’d teach on line at Craftsy, similar to how Lola Jenkins teaches her art on line. In case I don’t win a copy of your book; where can I purchase one? I’m another one who has this on her Christmas list. I’ve mapped my surrounding mountain in my mixed media work. I knew I wanted to quilt it as soon as I saw the ad for Valerie’s book. Valerie’s work is amazing. Thanks, Lyric for all your generous sharing. This book appears to be a must have!! When I am drawn to an artist’s work, it is usually visual. Valerie’s work has had such a strong pull on me from the first time I saw it and I think I have figured it out why. Not only is it eye candy- it is mind candy. Stunning. Oh! The haiku problem. The notion of the poetics of place really appeals to me. I really want to do that! I missed it at QSDS when I had a chance to be in a class with Valerie. She is a terrific teacher and I recommend folks who have the chance to work with her in person. Her book is an excellent second choice. I’d love to have a copy! If you have the opportunity to take a workshop with Valerie, I’d encourage you not to miss it. Besides being a great artist, she’s an inspiring teacher. Much of my work is about the Florida environment. I often include image transfers of maps in my work… historical, nautical, survey and construction maps, to reference the place the piece is about. I love maps, too. I made a quilt this year depicting a map of Baghdad, Iraq during the sectarian war. “One People” is dedicated to the spirit of long-time neighbors who decided to trade houses in order to conform to the new rules to live in Sunni or Shia sections of the city. The quilt is pictured on my website: http://annlouiselyman.com/?page_id=21. I would be delighted to win this book! This book is already on my Christmas list. I am also working on a quilt inspired by a trip to Barcelona, it is compasses trough the colour wheel after seeing the Gaudi cathedral. Oh, oh, oh – I have been eyeing this book since I first saw it in a magazine. It’s on my wish list this Christmas. I have two quilts in my head that are inspired by places — Paris and Switzerland. Maybe this book would help me get them out of my head? 😉 Oh, and I do have one that is made and was inspired by my country: http://www.quiltmatters.blogspot.ca/2013/06/happy-canada-day-eh.html. Thanks for the giveaway! Valerie’s book is on my wishlist! At the moment I’m creating a piece of work based on the map of a tiny island off the west coast of Ireland – a place which is very special to me! Lyric, thank you for taking the time to write this review. I was not familiar with Valerie Goodwin’s work prior to your post, but I can tell I would love to learn more about her work. I am expanding my quilting skills and exploring art quilting; I’d love to read her book. Thanks for the opportunity to put my name into the drawing. When bored as a little kid, I used to draw maps of imaginary places showing ponds, cabin, trees, pathway, etc. Now I draw landscape designs. On a recent flight to California, the view out the window inspired me to do a “bird’s eye view” of farms, streams, mountains and vineyards. I am putting Valerie’s book on my wish list (or certainly hunting for it in the library). This book is so unique. I’d love to own it. Anything to do with art, quilting and architecture, I’m there. Enjoyed your class in Blowing Rock. Thank you for being there. Valerie’s work is inspiring. Her book just went on my wish list.